Welcome to February! We had 169 (wow!) projects linked up in January - let's see if we can beat that this month! New to One Monthly Goal? Welcome! To join, share a photo of your project, some words about what you want to accomplish in a blog post, an Instagram post (tutorial) or a post on Flickr. Return t the end of the month and share your results. You can read about the event and the rules on the main event page. 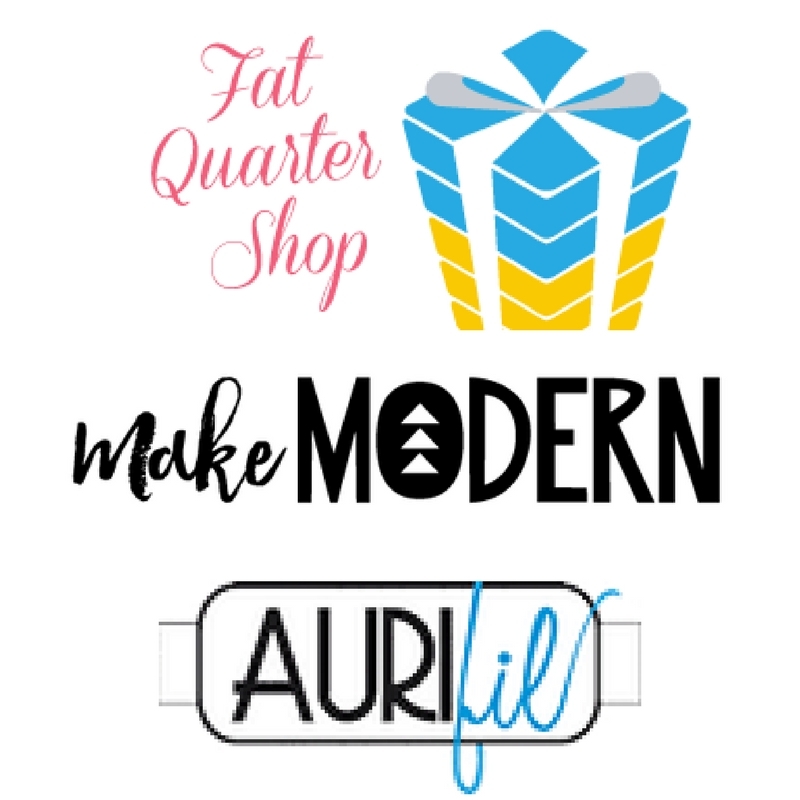 Fat Quarter Shop offers a tremendous selection of fabric, notions, books and just about anything you will need for your project. Consider their Sew Sampler box to receive a monthly surprise delivery of fabric and fun. Fat Quarter Shop is offering a $25 gift certificate to one lucky participant. Make Modern is a digital magazine launched by a collaboration of quilters based in Australia. 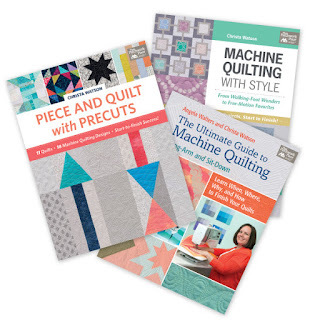 Their magazine is filled with modern quilt designs and a wonderful source of inspiration. Make Modern is offering a 6 month subscription to one lucky participant. Aurifil is home to a beautiful rainbow of thread in all weights, perfect for any of your sewing and quilting needs. My favorite product is the designer collection boxes which coordinate with various fabric lines. Aurifil is offering a thread set for the first quarter bonus prize. 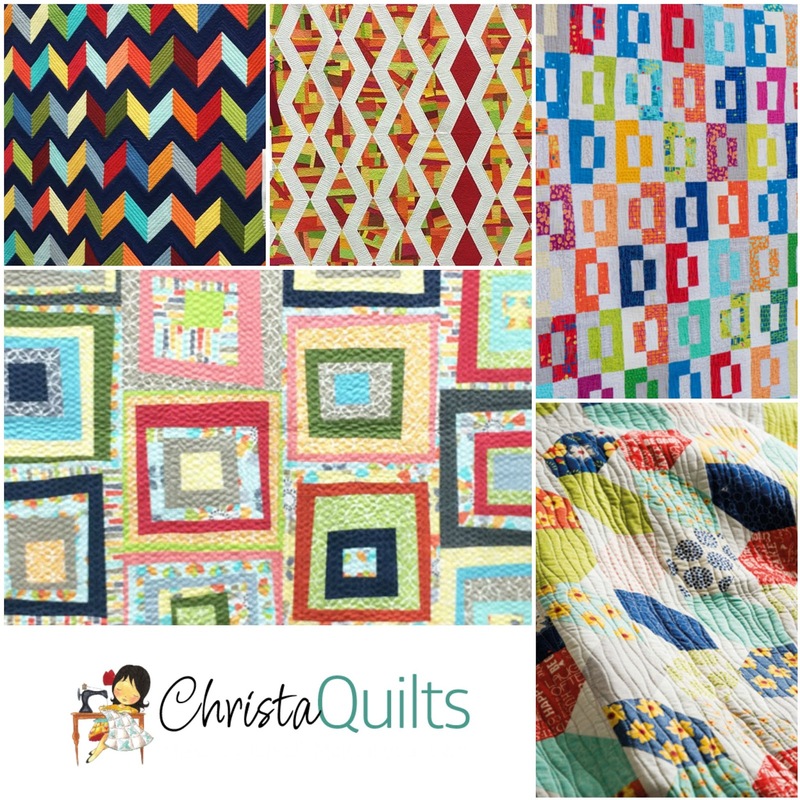 Christa Watson from Christa Quilts is our featured designer for February. Christa is an award winning quilter, a teacher, a quilt designer, and an author. With the release of her first fabric line, Modern Marks, and a second under development, Christa is also a fabric designer. Pictured on left is Christa showing off her new fabric line at October Quilt Market in both the quilts that surround her and the shirt she is wearing! 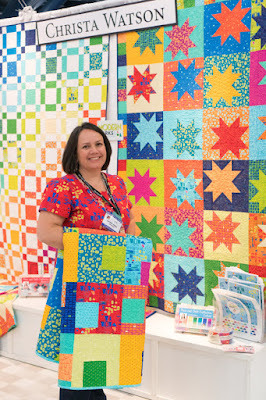 Christa loves to teach and inspire quilters to make their own quilts from start to finish. She is passionate about teaching quilters to quilt on their domestic sewing machine. Perhaps you've been lucky enough to have taken a class from her at a quilting or guild event? as well as on Craftsy. Her blog and Facebook page have multiple tutorials. Christa is currently running a QAL for her quilt Squiggles - a pattern from her latest book Piece and Quilt with Pre-Cuts. You can visit Christa on her blog, on Instagram, and on Facebook. Find her patterns in her store. Also, checkout her fabric store, The Precut Store. Her books are available from Amazon. Learn more about Christa on this great article on We All Sew. This article includes several free patterns including Modern Puzzle pictured in the above collage. My goal for February is to get back to work on my "Small Blocks and Scraps" quilt top - it needs a decision about borders, needs to be basted and the quilting started! Make sure you visit the One Monthly Goal event page for the specific requirements for links and social tags. Elm Street Quilts One Monthly Goal February Linkup. Sign up to receive email notifications when the One Monthly Goal linkup is open. Think of it as a helpful reminder! I hope you can made the border decision quicker than I did on my last project. I look forward to seeing how you quilt it. Thanks for hosting us. Oooh, pretty! You should definitely finish that one up. Good luck with your OMG. Yours is another quilt so close to being finished; good luck with the last phase. Hi, Patty! I love your Small Blocks and Scraps top. It will be even MORE beautiful at the end of this month! I'm an OMG virgin linking up with a goal for the very first time... ;-) Wish me luck! oooo - your OMG is pretty! That looks mighty much like a Dear Jane, are the blocks that small? Looking forward to seeing how you finish the top up. I love everything about your small blocks quilt. How small are the blocks? Good luck with your borders, I always agonize over that part for some reason. 169 linkups is great! Do you find they link up more or less as the year goes on? Or is there a lull during any season? That quilt top sure looks like it has had many hours of sewing and it looks so pretty. All the best for the next stage of the journey. Patty, I love your quilt that you're working on during February. What a treasure! That is a bright and pretty quilt, Patty. I hope you enjoy finishing the top this month! Wow Patty. 169 linkups. That's awesome. Good luck with your top. It looks pretty. Your scrappy blocks are so cute--I hope you can find some time to work on them! Small Blocks and Scraps is such a pretty quilt, good luck on achieving your goal. What wonderful prizes. April Finish link-up is open! !